Over the past week we’ve had the pleasure of digging through the back catalogue of Johnny ‘D’ De Mairo; an influential figure amongst the broader dance music community. A Brooklyn native, De Mairo was influenced by the infamous block parties of the 70’s along with quality New York radio stations such as WBLS with Frankie Crocker & FM 99X. De Mairo was the Senior Director of A&R at Atlantic Records & is responsible for Armand Van Helden’s collaboration with Tori Amos on ‘Professional Widow’. 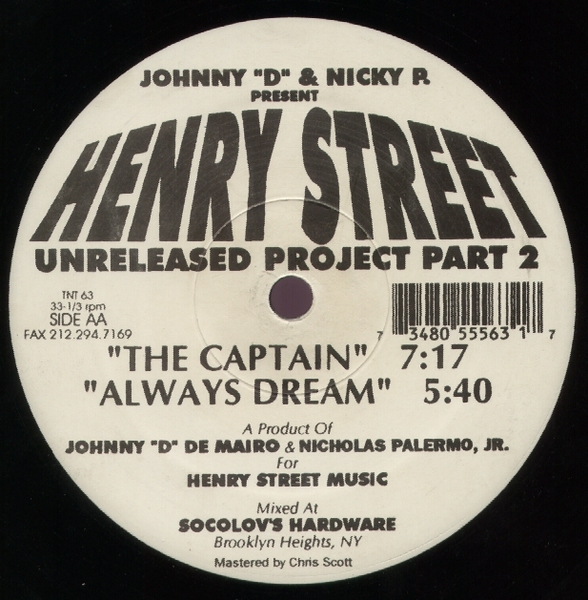 De Mairo & production partner Nicholas Palermo Jr started Henry Street Music in 1994 which was named after a cross street in his Brooklyn neighbourhood. Kenny ‘Dope’ Gonzales, a close friend of De Mairo’s released the Whew EP under the alias The Bucketheads as the first EP for the label. Gonzales & De Mairo were also responsible for putting the H.S.M label on the map with ‘The Bomb’ EP; a track sampling Street Player, the seminal disco hit by Chicago circa 1979. Whilst De Mairo is well known for his production dripping with disco samples, it was under his lesser known pseudonyms that produced some amazing house records. This EP was released on US label Cutting Traxx, founded by brothers Aldo & Amado Marin who also founded Cutting Records in the late 80’s. ‘Red Hook’ being another nod to his Brooklyn upbringing, De Mairo released ‘Your Love’ on DJ Duke’s Power Records. The track samples Freeez’s 1983’s hit ‘I.O.U’. This EP features thirteen remixes of Magic; Todd Terry, Kenny ‘Dope’, Roger S, MK & his brother Scotty all contribute with their own interpretation, however it’s Armand Van Helden who manages to pour the proverbial champagne over the crowd with his effort. Feels Good comes from the heavily sampled 1978 disco belter ‘It Looks Like Love’ by Goody Goody. We’ve mentioned earlier this year about Delgado’s work with Kenny ‘Dope’ & Todd Terry under the ‘Masters at Work’ guis, however his solo work also provides gold. ‘Soul Good’ samples Skyy ‘First Time Around’. Byrd Man’s Revenge samples Donald Byrd ‘Think Twice’.